The executive forum “Green Building with Drymix Mortar Technology’ has being organized in cooperation with The Petroleum Institute. It featured 6 lectures by MEDMA member companies and guest speakers as well as a keynote speech by our hosts. Close to 100 participants from Municipalities thoughout the Emirates, Federal Government (Ministries) as well as delegates from from major consultants, developers, contractors and suppliers of drymix mortars attended the Forum. Topics were focused on the environmental issues, the necessity and awareness of Green Building, economizing the limited energy resources and helping energy savings by using intelligent building materials. The contribution of drymix mortars to sustainable developments stood in the centre of the programme. The conference was moderated by Ferdinand Leopolder, Executive Director of MEDMA. MEDMA held its 4th Annual Conference on 25. 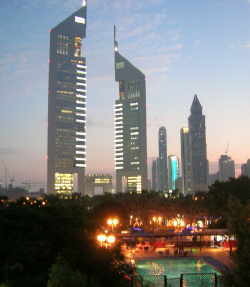 Nov 2009, 09:00 - 14:00 in Dubai, UAE. Like in the previous years, the conference was staged on and during BIG 5, the region's most important building materials fair. It was supported by DMG World Media, Media Sponsor was ZKG International. Sponsors included (in alphabetical order) BASF, Colmef, Dow Construction Chemicals, Eirich, Elotex, Frigmaires INternational, Falcon Chemicals, Grimm Metallpulver, Haver & Boecker, Kerneos, m-tec GmbH, Sodamco (Sodap) and Wacker Chemie. The executive forum “Green Building with Drymix Mortar Technology’ under the patronage of Dubai Municipality took place on 14 May 2009 in InterContinental Hotel Dubai Festival City and brought together around 100 participants from Dubai Municipality, Dubai Electricity and Water Authority, Abu Dhabi Municipality, Sharjah Municipality, RAK Municipality, Al Ain Municipality as well as delegates from from consultants, developers, contractors and suppliers. 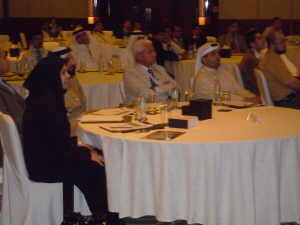 The conference was organized by MEDMA and co-organized by The United Arab Emirates Society of Engineers. It was sponsored by MEDMA members Colmef, Conmix, Laticrete RAK, Mapei and Wacker. The forum focused on the environmental issues, the necessity and awareness of Green Building, economizing the limited energy resources and helping energy savings by using intelligent building materials. The contribution of drymix mortars to sustainable developments stood in the centre of the programme. The opening speech was given by Ali Achmed Elian, Head of Engineering Materials Laboratories Section of Dubai Central Laboratories. Mr. Elian pointed out the environmental challenges with statistical information and studies and highlighted once again the necessity of green building. Ferdinand Leopolder of MEDMA moderated the forum, which cosisted of 5 more lectures about green building topics by Colmey, Conmix, Laticrete RAK, Mapei and Wacker. He also held the final lecture about the importance of quality certification and control systems, here especially the MEDMA SEAL OF QUALITY. The Middle East Drymix Mortar Association MEDMA e.V. held its 2008 Member's Assembly and Symposium on 10. March 2008 at Dubai International Exhibition Centre on Sheikh Zayed Road. 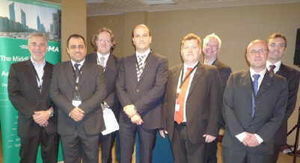 The event was hosted by DMG World Media, the organizers of the Middle East Coatings Show 2008, which took place in Dubai from 10 to 12 March 2008. The MEDMA Members Assembly and Symposium 2008 was intended to discuss the regional activities of this association, the progress of the Technical Committee and the introduction of the MEDMA SEAL OF QUALITY. This year's MEDMA conference takes place again in Dubai, parallel to and hosted by BIG 5 Industry Exhibition . The conference is free of charge, pre-registration necessary by e-mail to MEDMA, info(at)medma.org. Right after the conference, there is a festive dinner for all pre-registered guests. The conference location (like last year) the meeting room "Dubai" on the upper floor of the main concourse. Please find the summary and invitation, the programme will be published here, too. 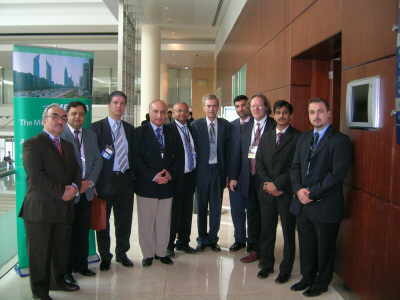 Honorary Board and Organizers:(from left to right): Dr. Saricimen (KFPUM, Dammam); Dr. Afride (NED University, Karachi), Dr. Mirhadi (Iran Technical University, Tehran), Prof. Samarai (University of Sharjah), Mr. Singh (MEDMA President), Mr. Walsh (General Manager, DMG Dubai), Dr. Tamimi (American University of Sharjah), Mr. Leopolder (MEDMA Secretary), Mr. Kanth, (REDA), Mr. Moussios (MEDMA Executive Committee). For download of printable .pdf invitation (3 MB) please click here. Laticrete RAK, MEDMA Exec. Comm.